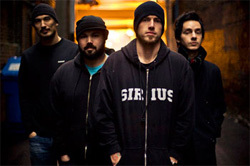 Fourteen years, seven albums, and hundreds and thousands of tour miles traveled, they are a band of many fortunes; Bad fortunes such as lineup changes and losing record labels, and good fortunes including touring with Deftones, Incubus, Mudvayne, as well as having multiple Top 20 singles off of various albums. Resilience is key when considering Taproot. Bassist Phil Lipscomb tells Maximum Ink a little about where he came from musically, and what sets Taproot and their fans apart. Maximum Ink: Where did you get your start with music? Phil Lipscomb: For me personally, my start was with my brother. I got my first bass off of him, and he had been playing guitar for years. I just got going from there. MI: You have been touring a lot in the past year or two. What do you do to stay sane when you’re on the road for months at a time? PL: Well, my dad was in the Air Force, and I’ve moved around all my life, so I really enjoy traveling. I love being on the road. Two or three months is a long time to be on the road. By the end of the tour, I get that, “I need to be home, and I need to be able to relax for a little bit,” feeling. For the most part, we’re all friends, we’ve been friends for years and we get along pretty well. That helps tremendously. MI: Taproot has had a lot of ups and downs since you’ve been on the scene. What is it that keeps you guys going because there are so many bands that seem to be dropping of the map after years of being together? PL: Well, I’d say two things. One, we’re hard workers, and we’ve never really stopped doing what we do. And two, we have a pretty strong fan base that always seems to be there. When we’re not doing as well on the radio or we’re not as popular in the public eye, we can still go out there and play to our core fan base that never seems to miss a show. MI: What do you think sets a Taproot fan apart from other fans? PL: It’s hard to say. We have a pretty eclectic group of fans. It’s not, “Oh, we have our metal fans,” or “Oh, we have our straight alternative rock people.” We do have a fairly diverse crowd out there which is really cool. We’re not just heavy, and we’re not just alternative rock. We get into a little bit of everything. I think they connect with what we have to say and get something out of it. MI: What’s it like touring with Absolution right now? PL:They’re great, man. They’re very helpful, and they’re just having fun. This tour is their first real one. We’ve been touring for ten or eleven years now, so it’s cool to see them get excited about every city we go to. MI: What has been the highlight of your career? Was it a certain show or touring with a band you looked up to or anything along those lines? PL: Honestly, we’ve been very lucky in that sense. I mean, having toured two Ozzfests, having toured with Deftones when they released White Pony, and, at the same time, Incubus when they released Make Yourself, two of my favorite albums from those bands. We went out with Linkin Park when they were getting big, Papa Roach when they were getting big, and turning out their first album. Disturbed, Mudvayne, the bands we’ve been out with has been a “who’s who” of modern rock really. Every year has something new. Every year has something different. Every year has something exciting. MI: Can you tell us if there’s any new music on the way, or are you guys concentrating on touring? PL: Just touring right now, but we’re planning on taking a little break in June and July. Hopefully, we’ll get on another tour for the fall and then writing and recording by the winter. Hopefully we’ll have an album out in the Spring of 2012. Don’t miss Taproot playing the Backbar in Janesville on Saturday, May 14th with Absolution.